The Sundance® Spa Store St. Catharines is our 4th location, where you will find the perfect Sundance® Hot Tub and Finnleo Sauna to improve your health and enhance your lifestyle all at the very best prices. Located at 210 Bunting Road, we are proud to be a part of St. Catharines, the largest city in the Niagara Region. 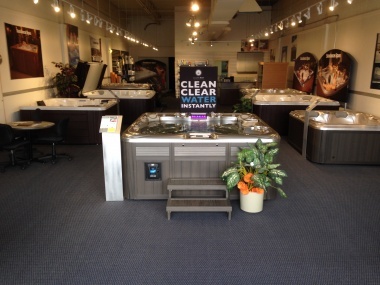 At our St. Catharines store, you will find a great selection of Sundance Hot Tubs, some running so that you can see them in action, some dry so you can sit in them to see just how comfortable they are! You will also find a selection of saunas from Finnleo, who have been a leader in the sauna industry since 1919. Traditional, Infrared and combination saunas are available. We carry a full range of hot tub water care products, filters, fragrances and accessories and provide a free water testing service. We deliver and service Sundance Hot Tubs and Finnleo Saunas in St. Catharines, Niagara-on-the-Lake, Welland, Niagara Falls, Thorold, Fort Erie, Grimsby, Port Colbourne, Pelham, Lincoln, Wainfleet and other locations across the Niagara Region. Best of all, our Sundace Spas are priced to sell with discounts and regular rebate programs on offer including great finance rates. Our St. Catharines location is home to our selection of Factory Certified Pre-Owned Sundance Spas, offering you the chance to purchase a used spa at a great price! Buying a Factory Certified Pre-Owned Spa gives you the peace of mind that your new-to-you hot tub has been filled and run before it is put out for sale to ensure everything is running as it should, and is backed by an in-store warranty. We also keep some plug 'n play models on display in St. Catharines that can be installed in your backyard without requiring the services of an electrician - Just fill it, plug it in to a regular electrical outlet and start to relax! If you are looking for a hot tub in St. Catharines, we invite you to come in and see us, we would love to show you the amazing features and benefits that are available on a Sundance Spa, We know we have the size and shape that will be perfect for you and your family to enjoy for years to come. At The Sundance® Spa Store St. Catharines, you will find a great selection of Sundance® Hot Tubs and Finnleo Saunas presented with dedication by our helpful and professional staff. Our goal is to assist you in finding the very best hot tub and sauna in the marketplace all backed up by the best warranties. Ask us about our famous Soak & Sweat Packages that will give you the best possible price on a Hot Tub / Sauna Combo in the Niagara Region!